It's time for show and tell of another cute cake, don't you think? This was a fun project that I started working on a week ago, so that all the fondant pieces would have time to dry, and then I baked and decorated the cake Saturday evening for a boy's first birthday party on Sunday. One of my brother's favorite movies as a kid was The Jungle Book, and I had all those songs playing through my head while I was working on this. 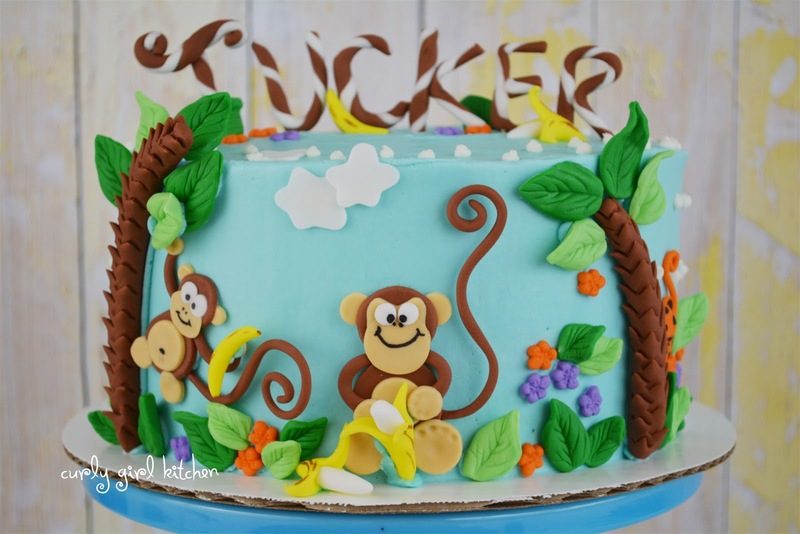 The theme for the party was "Jungle Monkeys", and I saw the invitation which was sky blue with white polka dots, and a big-bellied monkey holding a balloon, but other than that inspiration, the design itself was left up to me. Although it looks like there's a lot going on, there really were just a few basic designs I had to work out for each element: trees, leaves and flowers, monkeys, bananas, and his name for on top. Each individual element wasn't too terribly complicated to make on its own, and I thought they looked so adorable when all put together. I realize it would have been helpful if I'd taken photos of these pieces as I was making them, but I often forget to take "process" photos when I'm so focused on the finished result. The monkeys themselves are made just from various sized circles of medium brown and tan fondant, "glued" together with a drop of water. I cut different sized circles using both ends of my round piping tips and played around with the arrangements to make the monkeys' head, belly, feet, hands and ears, until I liked how they looked. I gave the smaller monkey (the one hanging from the tree) a slightly more baby-ish look by changing his face just a bit around the eyes, and giving him a quirkier smile. The tails and arms are formed from a piece of fondant that I rubbed between my hands to shape into long ropes. Then all that was left was to press indentations into the feet for the toes, and draw on the eyes, nostrils, mouth and belly button with a black edible marker. For the peeled bananas, I first took a small piece of white fondant and rolled it between my hands to shape it like a banana. Then I cut small triangles of yellow fondant, and wrapped them around the bottom half of the banana, overlapping each triangle, and pressing them together to smooth them out. I curled the points out, and drew on a few brown lines and marks with a brown edible marker. 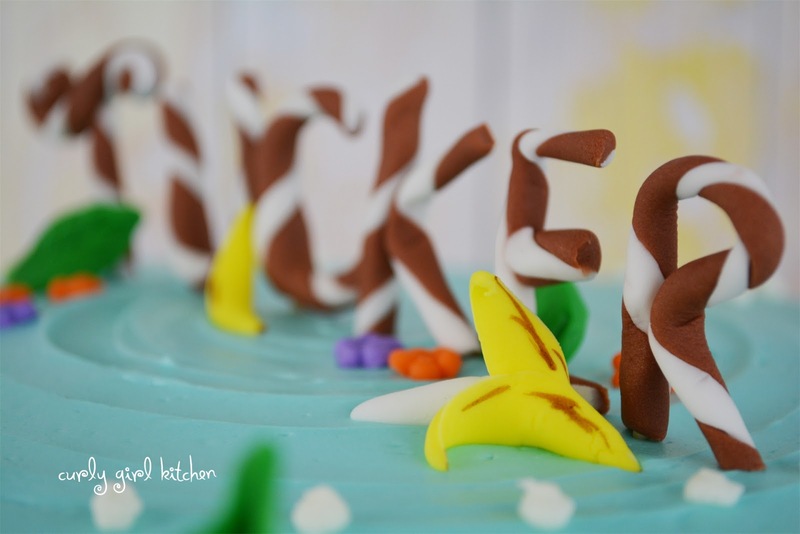 The unpeeled bananas are just a piece of yellow fondant shaped like a banana, with brown markings. The leaves and flowers were easily made with a little mold I have. And I made the tree trunks by shaping a thick log of fondant then snipping the "bark" with a pair of scissors. The tiger hiding behind the tree is just a simple circle of fondant with features created from a black edible marker, and a curly tail. 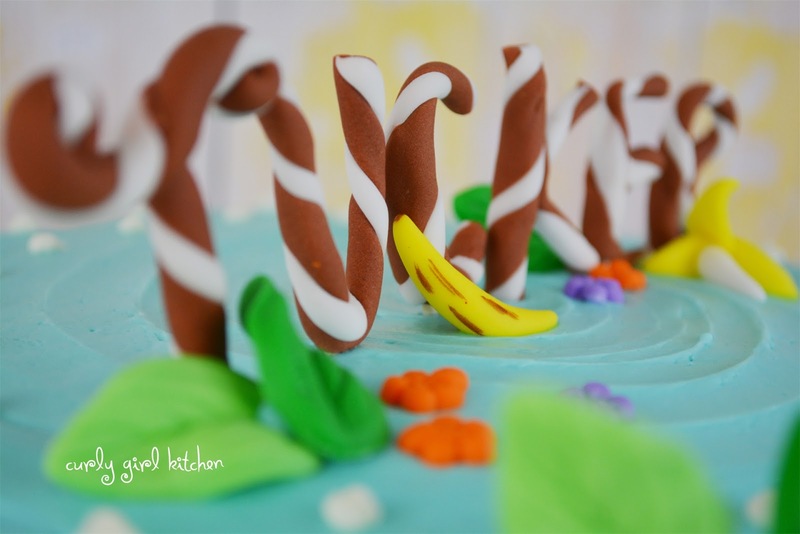 And for the name on top, I shaped ropes of brown and white fondant, twisted them together, and then shaped them into the letters for his name, wrapping them around the toothpicks as I went. When finished, set all the pieces on a parchment-lined baking sheet and let dry until hard, at least for several days. Then all the hard work is done ahead of time, and all you have left to do is bake and frost the cake, and stick all the pieces on with frosting. I hope this inspires you to make your cute little cake! 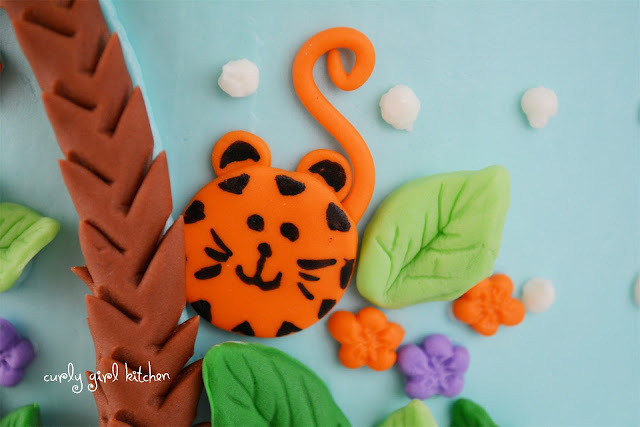 This cake is beautiful, fun and wild with color and action! I absolutely love it. At 53, I have never seen a cake so 'engaging'. I just want to get in there and start swinging with the monkeys!! I love it; you did a wonderful job! Do you sell these? 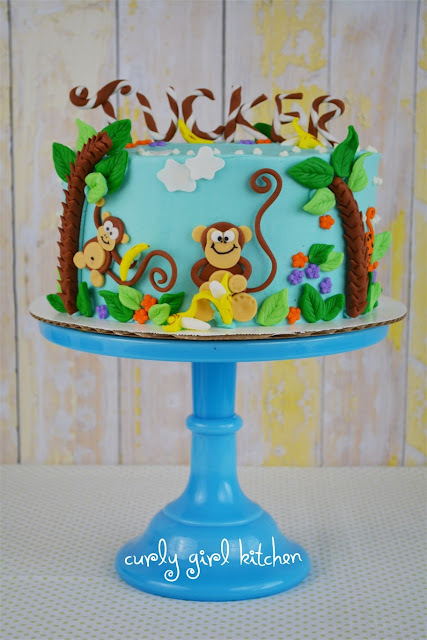 My grandson loves monkeys and would adore this cake. Thank you and I am looking for more cool cakes from you....although this one is difficult to beat! 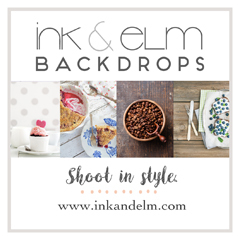 Hi Deb, What nice compliments - thank you so much! Do you happen to live in or near Denver? Thanks again, I have a more cakes lined up, so I hope to have many more to share soon!